Over the past 9 years, I have come across the magic number of hours to get the best photos without being rushed, and keep it fun. I find 3 hours for formals works best. 1 Hour for family, Lots of this time gets taken up moving people and visiting. 1 Hour for the wedding party, This gives enough time to travel to the location, and have some fun. 1 Hour for the couple, I send everyone away for this photoshoot. Makes it a lot easier to be relaxed and romantic with out an audience. For a lot of couples this will be the only time they spend together all day. The formals can be done after the ceremony, or before. If your're doing the formals before the ceremony, the list is reversed. The couple meet at a location, the wedding party joins them an hour later, then off to the Ceremony and Family photos after then off to the party. Doing most of the photos before the ceremony is becoming more and more popular, it's more relaxed and all your hair and makeup is perfect; And all the guys say it's still special when they see their bride coming down the isle. 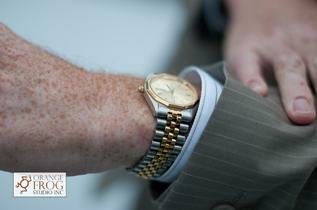 Your photographer can work with you to help with the time line, and recommendations. Feel free to give me a call if you have any questions.